Though it’s the world’s largest restaurant chain, Subway has had a rough go of it lately. Last year, it got into a spat with franchisees over $5 footlongs (R.I.P.) and closed more than 1,000 stores, sparking the creation of what might be one of the saddest stock graphics we’ve encountered. It’s tried breakfast sandwiches, wraps, and delivery, without major success. Hoping to turn around its ailing fortunes, Subway has announced a partnership with media brand Tastemade to inject new life into its staling menu. 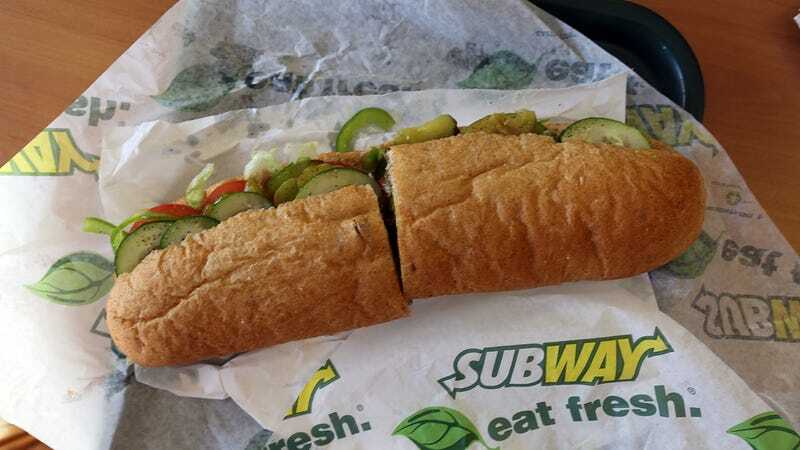 QSR Magazine reports the partnership hopes to “bring fresh takes to Subway’s menu, and also develop global and cultural connections to consumers.” In non-corporate speak, the goal is to mix up Subway’s menu with some new flavors, including trending ingredients. QSR cites the new Green Goddess Tuna Melt, the first sandwich developed with Tastemade, which just rolled out to 3,000 Subway locations. It takes a classic of Subway’s lineup—the tuna sandwich—but aims to make it more modern or intriguing with the addition of green goddess dressing, “a growing flavor trend.” Subway’s menu, as compared to competitors Au Bon Pain, Pret A Manger, or even Jimmy John’s, has traditionally been unadventurous. The most “exotic” flavor, currently, is teriyaki. But that could change thanks to the new partnership. Subway is currently testing a BLT&E, a deviled egg salad sandwich topped with cheddar cheese, bacon, lettuce, and fresh tomato slices, as well as carne asada and Southern French Dip sandwiches, which reflect “global and regional influences.” We don’t expect Subway to get too wild with its ingredients—I won’t hold my breath for a Szechuan peppercorn mayo or Vietnamese caramelized chicken wrap—but perhaps a banh mi or Cubano sandwich could help revive the chain’s reputation among consumers. It can’t get much worse.